The armies of Asia relied on a menacing curved sword for close-quarter combat that went by many different names. On the coat of arms of Finland, a crowned lion tramples upon a curved sword with his hind paws while brandishing a straight sword in his right forepaw. The straight sword represents Finland, and the curved sword represents Russia. Together, they symbolize the struggle between the West and the East. The curved sword depicted in the coat of arms is not the traditional Russian saber, but its forerunner, the scimitar, a sword found in cultures from North Africa to China. The Persian word shamshir, meaning “lion’s claw,” is generally acknowledged as the origin of the word scimitar. It had likely entered English usage by the way of French cimiterre or Italian cimitarra, the two Western countries having the most frequent dealings with the Arabs of North Africa and Muslims of the Levant. The curved sword is known by many names. In Arabic, it is known as a saif, in Turkey as a kilij, in Morocco as a nimcha, in Mughal India a tulwar, and in Afghanistan as a pulwar. As it adapted the scimitar, each country added its own national characteristics, but the basic definition of a scimitar remained the same. The scimitar is a backward- curved, single-edged sword with a thickened, unsharpened back edge. Due to this distinctive backward curve, scimitars sometimes are referred to as backswords. The blade of a scimitar is generally narrow and equal in width along most of its length. The upper third of the blade either narrows or widens toward the tip, and in some designs the upper third of the back edge of the blade is sharpened as well. Various features differentiate scimitar types, including where along the blade the curve begins, the depth of the curve, and the length, thickness, and weight of the blade. Other unique features include whether it has a blunt or sharp tip, inclusion and shape of the handguard, and shape of the hilt. Although there is no standard scimitar size, the sword is generally 30 to 36 inches in length, weighs approximately two pounds, and is approximately 11/2 inches wide. An Indian warrior is armed with a Damascene scimitar made from wootz steel. While it is a common mistake to regard the scimitar as a weapon exclusive to the Middle Eastern world, scimitars and straight swords existed side by side in the region for millennia. In the 7th century, scimi- tars first appeared among the Turko- Mongol nomads of Central Asia. A notable exception was the sickle- sword of ancient Egypt, which appeared to be an outgrowth of a battle axe rather than a true sword. As successive waves of nomads spread through Asia, their curved swords were adapted by the Indians, Persians, Arabs, and Chinese. With the steppe warriors migrating farther west, the scimitar entered Eastern Europe by way of Russia and Ukraine. The spread of the scimitar into Central and Western Europe can be tracked linguistically. From sabala of the Turkic-speaking peoples of Central Asia, it became sablya in the Russian language, szabla in Hungarian and Polish, sabel in German, sabre in French, and saber in English. Growing rapidly in popularity and adapted by more societies, scimitars did not completely replace straight swords. While the curved swords were generally lighter than straight swords of roughly the same length, there were many heavy scimitars and many light straight swords. Likewise, there was no clear distinction of straight swords being employed exclusively in the West, with the scimitars being employed exclusively in the East. During the Latin Crusades both Euro- pean knights, and Arab cavalry were armed with straight swords. European warriors used falchion swords with a straight blade on one side and a thicker and convex blade on the other. 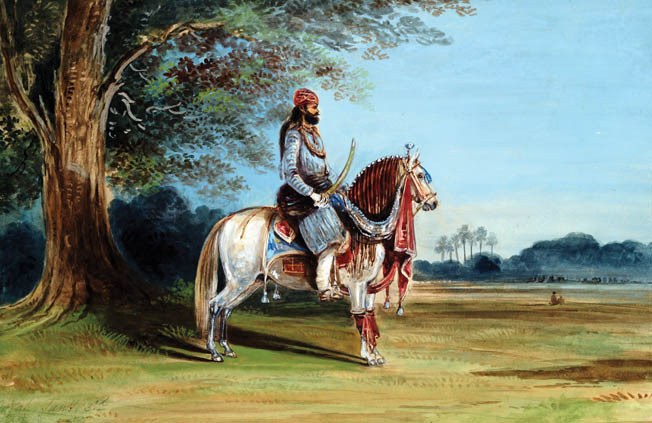 In India, warriors used a heavy straight sword called khanda. But in the Middle East, where lighter armor was worn, the curved sword was more widely adopted. A continuing challenge for medieval warriors was the contest between thick armor and heavy swords. Because of various climatic, economic, and cultural influences, the Western cultures adapted heavier armor, culiminating in full suits of plate armor in the 15th century. Improve- ments in armor drove the advancement of sword making. As metallurgy techniques improved over centuries, the straight dagger evolved into a long, straight sword. Only the finest crafted straight swords, available to a select group of warriors, could puncture through heavy armor. Most men-at-arms had to make do with cheaper swords, relying on chopping and battering their opponents. Thus the heavy straight swords, acting more like bludgeoning tools, did not require razor-sharp edges. The weight of the sword influenced the technique with which it was used in fighting. The greater weight of a long sword quickly wore out the swordsman’s wrist. To compensate for this, the long, straight blades were swung in sweeping motions using the momentum of body weight, while the short, straight swords were employed for thrusting in a forward motion. The low center of balance of a straight sword, close to the hilt, was advantageous in delivering piercing strikes. A Persian shah is shown with a kiliji. Originating in China in the 13th century, firearms capable of penetrating armor from a distance effectively brought an end to heavy swords and thick armor. As armor became lighter over the next three centuries and even- tually obsolete, scimitars and sabers came to dominate the contest of swords. During the Middle Ages, a sword was rarely a warrior’s primary weapon. European knights and men-at-arms used lances for the initial attack and maces, swords, and battle axes in the ensuing melee. 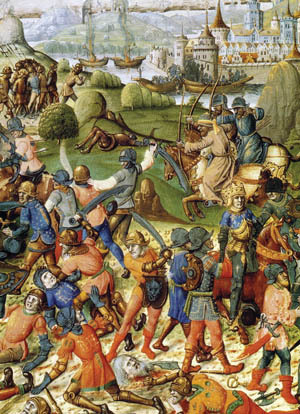 The lower classes used polearms, spears, and bow and arrow as their main weapons. Middle Eastern horse archers used composite bows as their primary shock weapon; however, through the cultures of that region the scimitar replaced the straight sword. In a clash between two swordsmen, the sword rarely played a decisive role by itself. The victory went to the man with better armor, skill, or strength. A man wearing heavy armor had difficulty evading a blow, thus medieval Euro- pean swordsmanship involved heavy use of blocking techniques. Blocking edge to edge quickly damaged the sword. One technique to overcome this problem was to parry the opponent’s blade with the side of one’s own blade, which involved a slight shift of the wrist. This was much easier done with a lighter curved sword than a heavier straight one, and it required extensive training to make this maneuver a natural one. The technique of using a light sword was dramatically different from that of a heavy sword. The lighter weight permitted the greater use of the wrist and elbow, which allowed more intri- cate maneuvers like faints, figure eights, and cir- cles. The primary strikes were cutting and slashing, using the top third of the blade, and and parrying. The center of balance of a curved sword moved farther along the blade, thus adding greater weight to the initial cutting motion. Curvature of a scimitar greatly reduced its utility when thrusting, and the tips of the scimitars with their greater curvature were frequently left dull. Those with slight curva- ture, like the Russian shashka, retained the sharp point and could be used in thrusting. When used in this way, the scimitar inflicted a wider cut than a straight sword of similar blade width. The legendary swordmakers of Damascus contributed greatly to the spread of scimitars. This curvature of the blade roughly divided the scimitars into two categories. One category was that of shorter blades with a pronounced curve, which primarily were used for cutting. The second category was longer blades with a gentle curve, which were used for both cutting and thrusting. Although scimitars were used by both foot and mounted soldiers, they were par- ticularly useful for the light cavalry. It is nat- ural for a warrior to swing a sword, which typically follows a circular downward trajectory. The curved blade allows its wielder to draw it in a tighter arc around the body. This was particularly useful to a cavalryman who had to avoid striking his horse’s head. After a chopping strike with a curved sword, a blade naturally continued to slide from the point of impact in a cutting motion, therby extending the cut and allowing its wielder to ride by without losing his grip on the sword. As the result of the chopping blow, delivered in a circular motion, the saber inflicted more serious injuries than a straight sword of the same weight and length. Blades with a greater curvature had a greater cutting effect. While a straight sword penetrated the body to reach vital organs and was deadlier as a rule, a curved sword was fully capable of cleaving open heads and severing limbs. There were recorded instances of particularly pow- erful blows with a scimitar, delivered at the junction of the neck and shoulder, penetrating deep into the torso. In addition, maiming injuries inflicted with a scimitar had a detrimental effect on morale of the opposing troops, especially on new recruits. Such feats of strength greatly depended on the quality of the blade. The Middle East boasted some of the best swordmakers in the world. The legendary swordmakers of Damas- cus contributed greatly to the spread of scimitars. Damascene swords with their distinctive flowing water pattern were greatly treasured. The key to their strength was the exceptional wootz steel with high-carbon content discovered in India in the 6th century BC Merchants brought ingots of wootz steel to Damascus in five-pound cakes. An Ottoman kilij is set with coral and turquoise. The kilij was particularly effective against heavy armor used in the 15th century. The flowing water pattern was the result of forge-welding steel with varying levels of car- bon content. 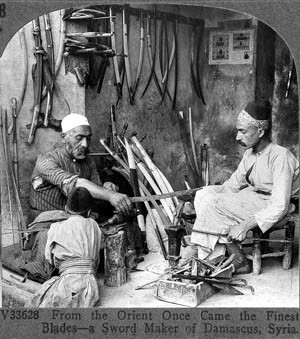 The best of the Damascene swords made from wootz steel can bend without breaking and remain sharp after prolonged use. The technique of making wootz steel was lost by the end of the 16th century. Although some scholars believe that the British forbade the manufacture of wootz steel as a means to disarm their Indian subjects, a British rule was not yet firmly established in the Indian subcontinent by the time the secret of wootz steel was lost. A British Hussar displays his curved saber. Hungarian hussars popularized the saber and facilitated its adoption throughout Europe. A similar manufacturing technique using bulat steel spread through Persia into Russia, but was lost there as well by the end of the 17th century; nevertheless, a keen interest in this exceptional steel remained. Swordmakers were able through extensive experimentation to recreate the process by the end of the 19th cen- tury, albeit not in its original form. Around the time the exports of wootz steel from India began to dry up, Syria came under Ottoman Turkish rule. Under the expansionist policies of the Ottoman Empire, weapons man- ufacture flourished in Asian and European provinces of the far-flung empire. There are two types of scimitars associated specifically with the Ottoman Turks. One is the kilij, whose blade has a pronounced curve at the distal third; that is, the farthest third from the base of the blade. This distal portion of the blade, which is known as the yelman, flares out and becomes wider. The added weight of the yelman, which came into service during the 14th century, was useful in overcoming heavier armor. The kilij was the forerunner of many sabers that spread through Eastern and South- eastern Europe. A shorter version of kilij was known as pala. Another distinctly Ottoman scimitar is the yatagan, the trademark weapon of the sultan’s janissary soldiers. The distal portion of a yatagan curved forward rather than backward, as in a typical scimitar. The curvature of this weapon was relatively gentle, which allowed it to be used for both stabbing and slashing. Some yatagans, particularly those employed by infantry, were double curved. The forward curve of the yatagan at the distal part of the blade brought the tip back in line with the hilt, allowing for better stabbing motion compared to a backward-curving scimitar. A few exceptionally made yatagans could even penetrate plate armor. The pommel of a yatagan was topped by distinctive protrusions that increased stability in the wielder’s hand. Typically a shorter weapon, more like a long knife, the yatagan was frequently carried in addition to a scimitar. While the scimitar was worn at the wearer’s side, the yatagan was carried tucked in the belt in front. The Afghan pulwar and Indian tulwar are similar in appear- ance, but they are readily differentiated by their pommels. The Indian tulwar features a flat disc at the end of the pommel, while the pommel of an Afghan pulwar is topped by a cup shape. 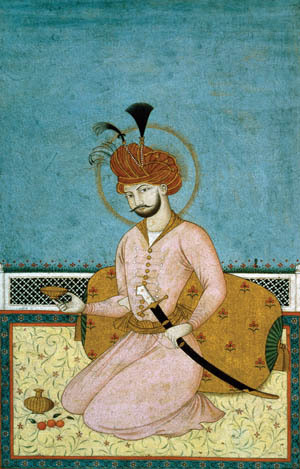 17th-century zulfiqar with its scissor-like blade. The zulfiqar image is frequently depicted on flags of the Muslim world. The European saber originated in Eastern Europe and was strongly influenced by the Hungarian and Polish szabla, a gently curving sword with a large hand guard. A Polish type of szabla called karabela, with an eagle-shaped pommel, was especially popular among the Polish nobility. Hungarian hussars popularized the saber and facilitated its adoption throughout Europe. Proving their worth against the Ottoman light cavalry, the hussars were widely imitated by other European states. By the 17th century, the saber was the prevalent weapon of European light cavalry, and it eventually spread to North America. A dashing hussar, elegantly dressed and sporting a curved saber, came to represent the romantic élan of the Napoleonic Era. In addition to cavalry, infantrymen of many continental armies in the 19th century were armed with short, curved swords as secondary weapons. Russian Cossacks serving on the empire’s southern borders adapted the shashka, the tra- ditional weapon of their Caucasus mountaineer adversaries. Its blade had a slight curve, allowing for both thrusting and slashing. The hilt did not have crossguards, and a distinct bend at the end of the pommel prevented the sword from slipping out of the hand. The shashka earned an excellent reputation. By the 1850s, it had become the standard weapon of the Russian Army. The Russians would use the shashka for another century. 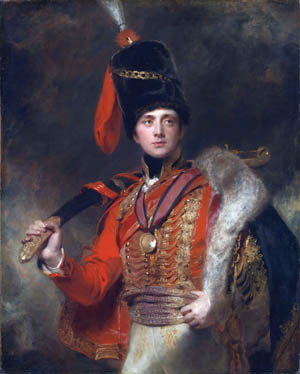 For the gallant actions of the U.S. Marines against the Barbary pirates on the coast of North Africa in 1805, the Ottoman viceroy presented First Lieutenant Presley O’Bannon with a Mameluk sword. The scimitar was modeled after the type used in Ottoman Egypt. Mameluk swords are still issued for ceremonial use to officers of the U.S. Marine Corps. Muslims armed with scimitars kill crusaders in a medieval manuscript. The Chinese version of a scimitar is the dao, also known as the Chinese broadsword. Resembling a machete, it is wide at the distal third of the blade, single edged, and gently curved, with a disc-shaped hand guard. Even though one does not generally think of the famous Japanese katana as a scimitar, its backward curve and single sharp edge places it in the same category. Although a typical katana, which has a 28-inch blade, is shorter than a typical scimitar, it is designed to be used with two hands in a powerful slashing motion. No discussion of scimitars can be complete without mentioning the zulfiqar, a more leg- endary than functional type of a sword. The original zulfiqar is said to have been given by Prophet Mohammad to his cousin Ali ibn Abi Talib at the Battle of Uhud in 625. It is com- monly depicted as a scimitar with a double tip or a scissor-like double blade, frequently dis- played on flags of the Muslim world, in partic- ular the Ottoman standards. In the 20th century, rapid-firing weapons came to rule the battlefield and the sword steadily lost its relevance. Nevertheless, the Soviet Union, Germany, and Poland employed large cavalry in World War II. In particular, the Soviet Union conducted multiple large-scale cavalry operations, although with a limited effect. Even though saber-wielding riders looked menacing in staged photos, a rifle and a machine gun were the primary weapons of the 20th-century cavalry. Although no longer used in combat, the curved sword survives to the present as a prominent feature of ceremonial military uniforms in most countries. In some modern military weddings, the bride and the groom pass under a sword arch and the curved edge of the scimitar is used to cut through the wedding cake as it did through bone and armor in the days gone by. Tags Afghanistan, Africa, army, Asia, axe, Barbary pirates, battlefield, blades, British, cavalry, China, CIA, Composite Bow, COSSAC, Cossack, Crusader, Crusades, Eastern Europe, Egypt, Europe, Falchion, Features, Finland, French, general, German, Germany, india, Japan, Japanese, karabela, katana, kiliji, Knife, knights, lance, machete, machine gun, Mameluk, Marines, Mary, medieval war, military, moh, Muslim, napoleon, north africa, NSA, OSS, Ottoman Empire, Persia, Persian, Pola, Poland, polearm, POW, Roman, Russia, saber, scimitars, shaska, Soviet Union, spear, sword, swords, Syria, szalbla, Tern, Tory, Turkey, Ukraine, Union, waves, weapons, WIN, World War I, zulfiqar.